Free Specialty Service when one purchases Five Specialty Services from Sovereign Pest Control. Specialty Services for Mosquitoes, Outdoor Party Service, Stinkbug-Box Elder Bugs, Bee Nest Removal, Flies, Pantry Pests, and Cicada Killers. 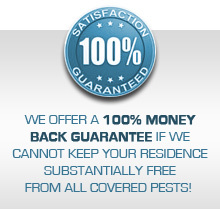 Now is the time to enjoy a pest free environment with the Free Specialty Service. Buy Five and get Sixth FREE Special! Tired of throwing food away that has been contaminated by those annoying meal moths or grain weevils? Sovereign Pest Control’s Pantry Pest Service is the answer. Planning a party, outdoor wedding, or special event? We understand how annoying it can be to have mosquitoes and flies hovering around your food during a party or event. Ask about our Fly, Mosquito, or Outdoor Party Service! For your convenience, we schedule Exact Time appointments and our technicians use GPS to ensure promptness. We appreciate the opportunity to service your home and we look forward to hearing from you. Additional discounts are available when you purchase more than one service. Be sure to check back often for future promotions.